These handmade, pop art cushions have colorful comfort food photography applied directly to the fabric. Curl up with these comfort cushions for an indulgent nap or an afternoon with that novel you've been craving. Designer Ronda J Smith combines her two loves of photography and sewing by applying her colorful photos directly onto fabric, and then hand-stitching them into fanciful cushions. The result is an absolutely delicious, pop art accent for your living room, reading nook or kitchen. Handmade in Brooklyn, New York. Ronda Smith was born in Detroit, studied photography at the Art Institute of Fort Lauderdale, and now resides in Brooklyn. When not producing pillows or sourcing out new objects to turn into couch art, she works as a photographer, specializing in food and still life. My teenage daughter LOVES pretzels and will love this pillow for years to come! Each fall there is a well-attended, week-long, Oktoberfest celebration paying homage to the German heritage in our area. 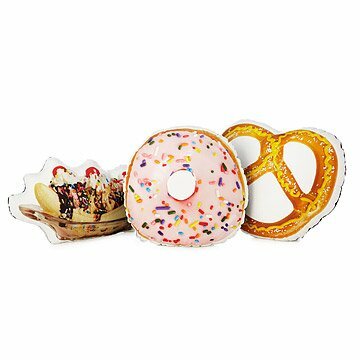 The pretzel pillow is a perfect gift for a patient, speaker or any visitor to our center during that time. It arrived with lots of mustard already on it--looks tasty. I bought this for myself as a birthday present because, well, I have a massive weakness for doughnuts :) Great color, design for decorative use. Unique and fun gift!